Welcome to our inaugural fall lifestyle mixer! We’ll be gathering at ATLAS Workbase in October to celebrate Autumn and network in a different type of venue. We’re joined by this month’s partners: ATLAS Workbase, Kwanchai Premium Vodka, De Maria Partners Real Estate, RB Photography, Kwanchai Events, and our first non-profit partner YouthCare. 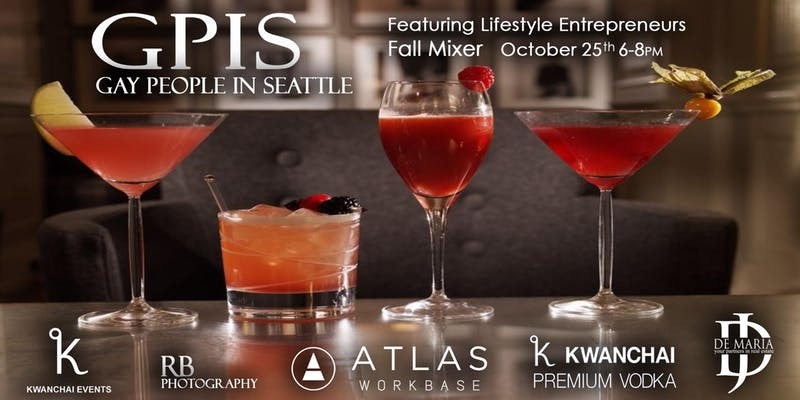 These lifestyle brands have come together to turn the monthly GPiS Mixer into a fabulous open house of fun at the only gay owned co-working place in Seattle. We’ll be serving up a hosted bar of beer, vodka cocktails, and soft drinks. Tasty hor d’oeuvres will be provided and the option to purchase more substantial food will be available from Konvene Coffee. The festivities will begin at 6pm, but from 12noon-6pm everyone may come early and finish their workday at ATLAS Workbase and enjoy refreshments, comfortable seating for working and meeting, fast and secure wifi, and power everywhere. We advise everyone to walk, bike, rideshare, or public transit to this event. If you must drive, there is $12-$15 parking at Seattle Center as well as other garages and street parking around ATLAS available. Unfortunately, there is no onsite parking in the ATLAS/QFC garage for this event.